Welcome to the first in a series on The Beatitudes. #Jesus set the tone early on with His ministry and what it means to be His disciple. Jesus set the tone early on in His ministry regarding what He was about and what it meant to be His disciple and have a Kingdom mindset. Soon after He was baptized, and Jesus had gathered the twelve disciples, He taught a series of sermons on a mountain. Prior to Matthew chapter 5 we read that Jesus had been in and around Galilee teaching and preaching to the people. Now when Jesus saw the crowds, he went up on a mountainside and sat down. His disciples came to him, and he began to teach them (Matthew 5:1-2). The Sermon on the Mount is the longest continual bit of teaching from Jesus spanning over what was likely several days of teaching. These teachings can be found in three chapters in the book of Matthew. The teachings fr are considered paramount for those who are following after Jesus. During His Sermons on the Mount, Jesus address not just His disciples, but the crowds of people following Him, and you can sure bet, amongst them were also some of the religious leaders of the day. The disciples were those who were fully committed to following Jesus as Messiah and His ways. These disciples would include at the very least the original twelve, and then possibly some of the others who followed after Him as His disciples as well. The crowds of people were those who were curious and often astounded by Jesus’ teaching and ministry, but they remained uncommitted to Him and His ways. 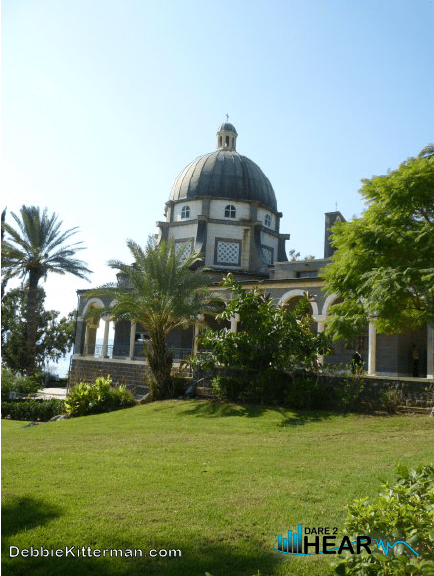 The Mount Jesus chose to settle in on and teach was a hill overlooking the sea of Galilee just to the Northwest and above the town of Capernaum. Today if you were to travel to Israel, you would see a 20th century church, called the Church of the Beatitudes, standing on the site where they believe Jesus taught. In 2009 I had the privilege to travel to Israel and I saw this location first hand. The top of the mountain has a fantastic panoramic view, and the way the hill was sloped it served as a natural outdoor amphitheater thus allowing Jesus to speak and his voice be projected to those gathered to listen. Many believe Jesus would have taught from the middle of the mountain so those above and below could hear His voice. The Church of the Beatitudes is amazing. 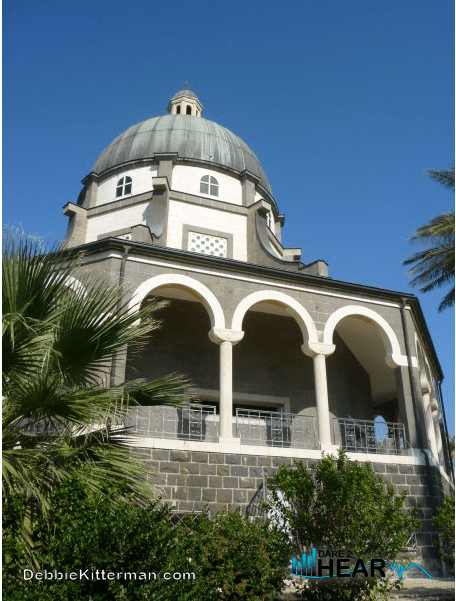 It was built with eight-sides to represent the eight beatitudes. What exactly are the Beatitudes and why are they important for us who follow Jesus today? 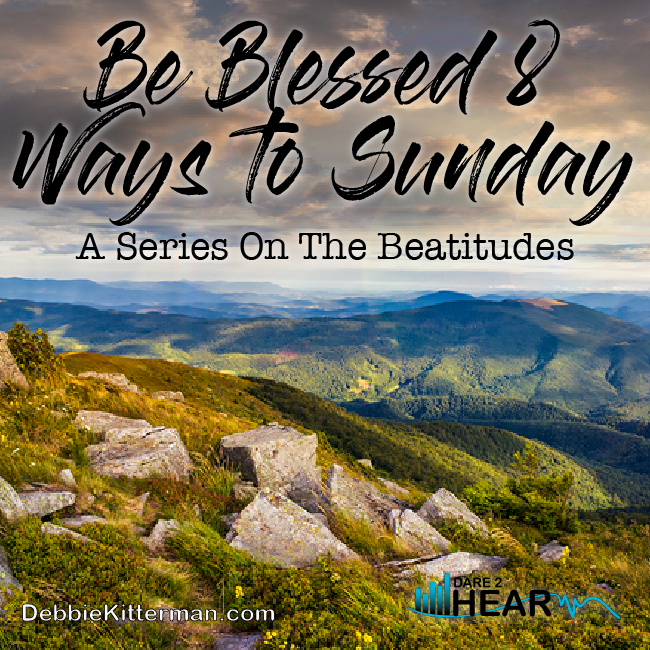 The word beatitude comes from the Latin word beatus which means “happy” or “blessed.” So, the Beatitudes are about being happy and blessed as we go about living our life, in the kingdom. Yes, that’s right, after Jesus comes out from the wilderness where He was fasted and was tested He immediately began His ministry by announcing the coming of the kingdom of heaven. From that time on Jesus began to preach, “Repent, for the kingdom of heaven has come near (Matthew 4:17). Jesus then went about teaching, healing and setting people free as a demonstration of the coming Kingdom and as a fulfilment of God’s promises through the Old Testament Prophets. In light of this, the teachings in the Sermon on the Mount are descriptions and instructions for those living in the kingdom of heaven. When Jesus came to earth, He brought the kingdom with Him and He modeled for us how we could also operate and live in and under the principles of His Kingdom. Jesus made it his ministry to preach the coming of the kingdom, teach the way of the kingdom, and demonstrate the purpose and power of the kingdom by healing the sick. Preaching, teaching, and healing. The Sermon on the Mount teachings are a demonstration of what we should be living as Christ followers. These teachings are the foundation for what Jesus modeled and would be doing for the next three years of His earthly ministry. Over the next few years of His ministry Jesus would put into practice for all to see each lesson He taught during this session of sermons on the mount. These messages which He shared are a part of the good news of Gospel. The Gospel message that Jesus was indeed the Messiah. He had come to establish His kingdom and equip disciples to share that good news with the world. The Beatitudes are the good news of the Gospel of the Kingdom that Jesus preached for the here and now and also for the Kingdom to come. I look forward to diving in deeper to each one of the 8 Beatitudes in the weeks to come. Matthew 5,6,7 – the first long discourse from Jesus the Master Teacher. I have a new book in my 31-Day series, 31 Days Inside Matthew 6. I read ch 6 in January and thought “this is everything a new (or old) believer needs” to be successful in following Christ. Good series for you, I’ll look forward to reading it. Oh yay and congratulations Susan! I am so exited for your newest book! Woo Hoo, you go girl. I am so glad you will be joining for this series and you are right – Jesus and His Sermon on the Mount teaching are everything we as believers need to be successful. I love praying through the Beatitudes when I pray for my family. Really looking forward to spending time in them with you here. The teachings of Jesus when he was on the mount are so rich. I hope to join you for your series! Kelly, I hope you can join me each week as well. I so love having you here. ans yes, His teachings on the Mount are rich indeed! Just last night at tea with a friend she was asking what was the main message Jesus was teaching. You outlined it well in the post. Oh Theresa, God is so good like that isn’t He? I mean you were talking about it last night and your friend had questions and ta-da – here is my post. This series has been on my heart for a few months but I need time to dig in and research, because while I have read the Beatitudes for years, I didn’t really know the deeper things. 🙂 Thanks for being here today, and please share anything with your friend that might help. I’m so happy that you’re doing a series on the Beatitudes just as I am memorizing them! This is good information here, Debbie. I’ll share it with the community I’m memorizing with. I look forward to your next post. Thank you for this overview! One day I will get to the Holy Land to see that temple myself, but I enjoyed your picture! You did a great job in pointing out the message of Jesus. Thanks for sharing this. Thanks for hosting and I hope that you have a wonderful weekend. Thank you Patrick! and you are most welcome. I am off to a women’s retreat this weekend, so I am praying it will be wonderful. You have yourself a great one as well. I hope your first week of April has been a great one! I hope the spring has sprung in your neck of the woods. We’re still getting flurries. Thank you for the party and your spiritual messages each week! You are welcome Jas! Spring is trying to make an appearance, but lately it has been rain, rain and more rain. Our small group has been studying the Sermon on the Mount together. It’s been so good and very convicting as well! Elizabeth – that is wonderful – what a powerful and rich study that must be! I don’t know why I never found your blog before, but I will drop in again. Thank you for sharing your thoughts on the Beatitudes on the #LMMLinkup this week.